Note: This article describes the functionality found in the Red Hat Container Development Kit 3.0 Beta. Features and functionality may change in future versions. The Red Hat Container Development Kit (CDK) provides an all-in-one environment to not only build and test Docker containers, but to make use of them on Red Hat OpenShift Container Platform; all from a single developer’s machine. Since its inception, the CDK used Vagrant as the provisioning platform. Starting with version 3.0, the CDK now makes use of Minishift for the underlying provisioner. The transition to Minishift based CDK 3.0 reduces the number of dependencies that need to be installed and configured. Only a hypervisor such as VirtualBox or KVM is now required. One of the best parts of the CDK is that is provides a fully functional environment that a developer can immediately make use of. However, the transition to CDK 3.0 did omit one of the key features found in prior versions: preconfigured persistent storage. In CDK 2.0, three (3) Persistent Volumes for use by OpenShift were preconfigured to provide applications with long term storage. A Network File System (NFS) server was configured on the host machine to provide such functionality. The Minishift host does not have an NFS server configured. However, one of the alternative storage types provided by OpenShift can be used instead: HostPath. The HostPath volume plugin makes use of storage on the underlying container host without needing to install any additional software. Three new Persistent Volumes should be created in the /var/lib/minishift/pv directory represented by folders pv01 pv02 and pv03. By default, when accessing the Minishift machine using the SSH command, you are logged in as a user called docker. Since this directory is privileged and protected and owned by the root user, sudo up. One of the key benefits of the CDK is that it is built on top of a Red Hat Enterprise Linux (RHEL) base. One of the security features inherent with RHEL is SELinux which provides added protections for not only the host, but any container that uses it as a base. By default, containers are restricted from writing directly to the underlying host file system. To allow a container to write to the directories created for the Persistent Volumes, the SELinux label svirt_sandbox_file_t must be set. The use of persistent storage, especially during the development phase, provides additional capabilities when creating containerized applications. Even though pipelines provides a powerful and extensive framework, one of the challenges faced by those developing Jenkinsfiles are the specific syntaxes that can be applied. This can be partially attributed to a prior familiarity with a GUI based configuration approach, or lack of extensive formal documentation and tooling. To address these shortcomings, a new plugin called the Pipeline-Model-Definition plugin was developed which focused on a declarative methodology for describing Jenkinsfiles. The result is a syntax that is both easier to develop and understand as it models the pattern of the traditional freestyle job type. A more in depth look at the pipeline-model-definition plugin and declarative syntax can be found in the article, Announcing the beta of Declarative Pipeline Syntax. One of the features also included in the Pipeline-Model-Definition plugin is the ability to validate the contents and syntax of a Jenkinsfile. Validation is performed by an exposing functionality to remotely verify the provided Jenkinsfile’s conforms with the configuration of the target Jenkins server. This was a much-needed enhancement that had been missing in the entire pipelines ecosystem. Since the content of a Jenkinsfile is groovy based, a developer could perform some form of initial validation on their local machine. The true test to whether a Jenkinsfile was syntactically correct could only occur once it was executed on the Jenkins server resulting in additional testing and development cycles if any issues arose. Before a Jenkinsfile can be validated, the Pipeline-Model-Definition plugin must be installed on the Jenkins server. Login to the Jenkins server and select Manage Jenkins. Select Manage Plugins and on the Available tab to view the available plugins. Locate the Pipeline: Model Definition plugin and select Download now and install after restart. Each of the prior commands assumes a file called Jenkinsfile is present in the current directory. While these options for validating a Jenkinsfile are certainly useful, they do fall outside of the actions a typical developer would take to build and test their application code. Instead, another approach would be to directly integrate the validation into an existing build process. For Java based applications, a Maven plugin called the jenkinsfile-maven-plugin has been developed to streamline the validation process. Any errors in the validation process will cause the build to fail and the specific exception to be printed out. A full list of available options can be found within the project repository. Being able to validate the content of a Jenkinsfile during the development process helps ensure compliance with both the structure of the Jenkinsfile and the available tools on the Jenkins server. Each of these benefits helps shorten the overall software development lifecycle and release software faster. Jenkins, the Open Source continuous integration server, has been included as a supported offering on OpenShift since the release of OpenShift version 3.1. With only a few simple clicks, an entire continuous integration and delivery pipeline for automating and simplifying the application build and deployment process can be created. All a user needs to do is use the OpenShift web console or command line tool, select the Jenkins template, and log in to the deployed Jenkins environment using the password entered or automatically generated. The Jenkins image for OpenShift provides a fully containerize solution supported by plugins specifically designed for integration with OpenShift. One feature that had been missing previously was the ability to leverage OpenShift as a single sign on (SSO) provider and apply the same authentication mechanisms to access Jenkins. As a user attempts to access a protected resource, they are redirected to authenticate with OpenShift. After authenticating successfully, they are redirected back to the original application with an OAuth token that can be used by the application to make requests on behalf the user. A similar approach already exists for the Kibana integrated aggregated logging solution. A newly released Jenkins plugin, called the OpenShift Login Plugin, now provides the support to enable this functionality. The first step towards implementing this solution is to add the OpenShift Login Plugin to Jenkins. Adding a plugin to Jenkins takes only a few steps. Login to Jenkins and on the left side of the page, select Manage Jenkins and then Manage Plugins. On the Available tab, enter “OpenShift Login” in the textbox to limit the available plugins presented. 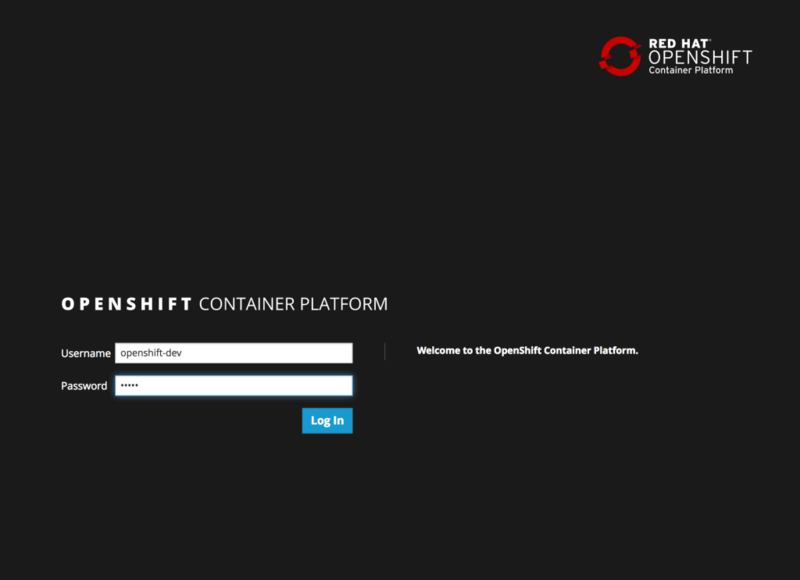 Select the “OpenShift Login Plugin” and click Download Now and Install After Restart. As it’s downloading, be sure to check the “Restart Jenkins when the installation is complete and no jobs are running” so that Jenkins restarts once the plugin has been downloaded. After Jenkins restarts, login once again. The first method is to create a new standalone OAuth client. An OAuthClient is another API object type, similar to other API objects such as a Pod, Service and Route. However, since it is configured at the cluster level, the ability to create or modify is restricted to only elevated users, such as cluster administrators. If your user does not have this level of access, the service account method as described in a subsequent section must be used. When configuring the OAuth client within an application such as Jenkins, the name in the metadata section is analogous to a client_id. The secret is an access credential that is shared with both the authorization server (OpenShift) and the client (Jenkins) and is used to determine trust between each other. Finally, the redirect URI field specifies the location the OAuth server will redirect the user once the authorization process completes (successfully or unsuccessfully). To simplify the creation of an OAuth client, an OpenShit template has been created to streamline the process and allows for the user to provide values for the OAuthClient name, secret and a single redirect URI. If a secret is not provided, one will be automatically generated. Execute the following command to add the template to OpenShift. With the OAuthClient in place, configure Jenkins to make use of the OpenShift Login plugin. Navigate to the Jenkins summary page and click Manage Jenkins and then Configure Global Security. 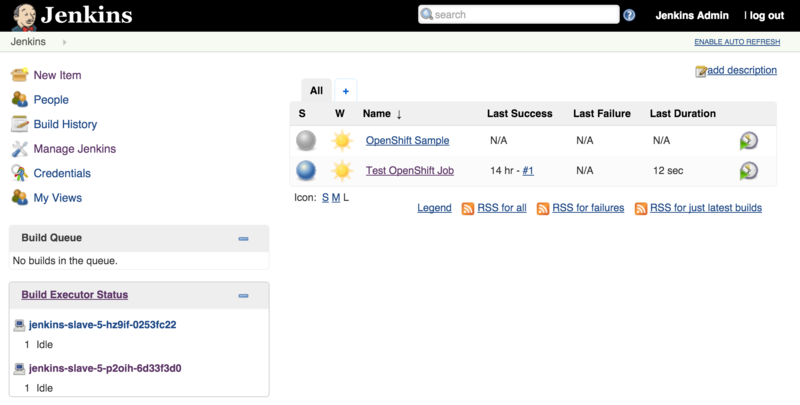 Select the Login with OpenShift radio button to expose several textboxes for further configuration. Click Save to apply the changes. Once the changes have been made, click the logout button on the top right corner of the page. This will trigger a new authentication process and redirect the user to the OpenShift web console to authenticate. Enter a valid username and password, click Login and authentication will be performed against the realm configured within OpenShift and upon success, the browser will redirect back to the Jenkins home page. One of the benefits of a Platform as a Service is the ability for developers to rapidly deploy applications to an elastic, cloud based environment. The application workflow typically involves a developer providing the location of source code in a Git repository that is remotely accessible by the platform for it to retrieve, and to facilitate the build and deployment process. 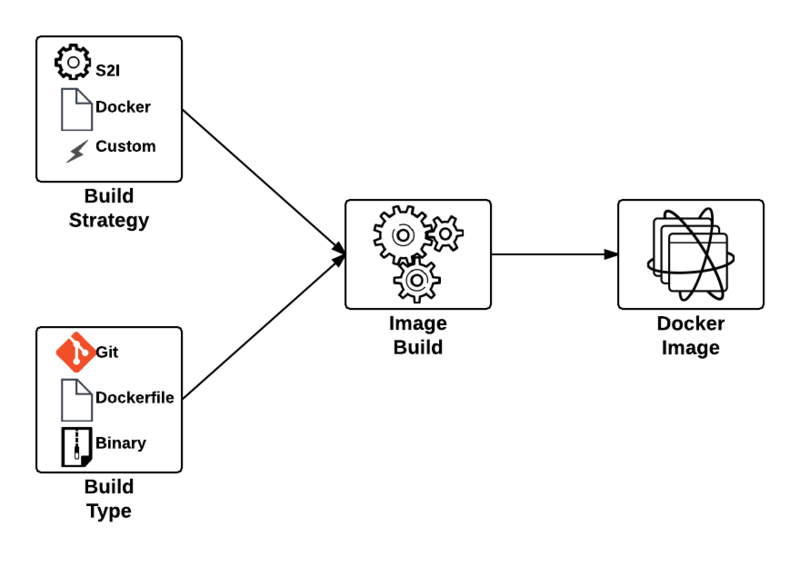 In OpenShift, the two most common build types, Docker and Source to Image (S2I), follow this paradigm. The developer will provide the location of a Git repository, and OpenShift will retrieve the source and perform the build depending on the type. While this workflow is extremely effective, it does require the developer to complete several intermediately steps beforehand, such as allocating and pushing to a Git repository for the platform to pull from. An alternative solution is to utilize another source type supported in OpenShift, called binary builds. Instead of OpenShift using a remote Git repository to pull a source from, the developer directly pushes their content to OpenShift. This type of build workflow has several benefits developers can take advantage of. First, they can quickly deploy their application to the platform without requiring the allocation of other resources or dependencies, such as a Git repository. Secondly, if the developer has an existing binary artifact, such as precompiled Java web archives (.war), they can deploy it directly to the platform instead of storing it in a Git repository, which is not recommended. 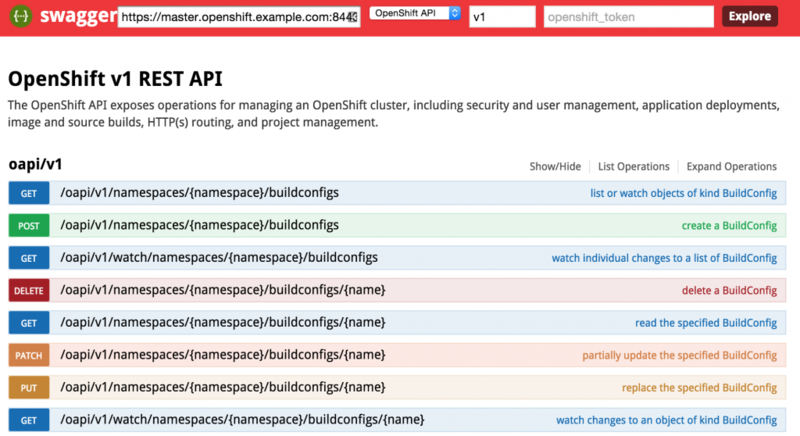 The builds section of the OpenShift documentation provides a summary of the subcommand options including a list of flags that can be added to further customize their behavior. "description": "Defines how to build the application"
The type value is replaced with Binary to indicate the binary build type, and the details of the binary build is entered in a binary section replacing the git section details. The asFile value is used to provide the name of a file containing the binary content that should be created inside the OpenShift builder. Since this field is empty in this example, the contents of the binary source will be extracted into the builder. In part 1 and part 2 of the series on Jenkins and OpenShift, we used OpenShift as the execution environment to run a Jenkins master instance and a set of either statically defined or dynamically provisioned slave instances. However, many organizations already have an existing Jenkins infrastructure in place to act as the backbone of their continuous integration and continuous delivery pipelines, but they may still desire the ability to take advantage of the elasticity OpenShift can provide. The following outlines the steps necessary for integrating an external Jenkins environment with OpenShift to run jobs. First, lets review the high level architecture from the first two posts. Each of the master and slave instances are run in Docker containers and deployed to OpenShift as pods. When creating a static set of slave instances, each of the slaves is configured to use Kubernetes services in order to communicate with the master and register itself in Jenkins. The use of Kubernetes services provide a level of abstraction over the actual location of the master since pods, like docker containers, can come and go. Once the slaves have registered themselves with the master, they will be able to take on pending jobs. When leveraging the Kubernetes Jenkins plugin to dynamically provision slave instances, many of the same steps described previously are used, however, instead of statically deploying a set of slave pods, the Jenkins master communicates with the OpenShift API to manage the lifecycle of slave instances. In both paradigms, each use two Kubernetes services to locate and communicate with the master. This is the key area that will need to change when integrating an external Jenkins instance. Instead of the service being configured to point to the Jenkins master in the OpenShift cluster, it will instead be configured to point to the location of the instance externally. The jenkins-cluster-persistent and jenkins-cluster-ephemeral templates are almost identical to the previous postings, A new third template is available to create the service objects to support existing Jenkins instances within the enterprise. Instead of load balancing a set of pods running in OpenShift, the template uses external services to reference the location of the Jenkins master outside of OpenShift. Lets once again instantiate the template to create a Jenkins master and slave infrastructure in OpenShift. You may be wondering why we would want to leverage a template that creates the Jenkins master in OpenShift when we will be communicating with an externally facing instance. To support both use cases where the master may be running either in OpenShift or externally, we will use the same template and if it is chosen to leverage an external instance, the objects in OpenShift relating to the master can be deleted. In a previous post, Clustering Jenkins on OpenShift, we introduced how to run the Jenkins Continuous Integration server connected to a collection of slave instances that are used to run Jenkins jobs, all within OpenShift. The slave instances were configured as a pool of running Docker containers that are automatically discovered by the Jenkins master through the use of the Jenkins Swarm plugin. This pool could be scaled up or down as necessary and provides the ability to handle the most robust workload that is only capped by the resource limitations of the cloud infrastructure. While this approach gives administrators the flexibility to define the state of their infrastructure, it can result in wasted resources as slaves become idle waiting to take on incoming job requests. An alternative approach is for the Jenkins master to dynamically provision slave instances as necessary within the OpenShift environment. This process is facilitated by the Jenkins Kubernetes plugin and in a few short steps, Jenkins can be configured to run jobs using dynamically provisioned slaves or complement a set of existing statically defined slaves using the Swarm plugin as described earlier. Prior to creating any resources within OpenShift, let’s discuss the components involved in being able to dynamically provision Jenkins slave instances. Note: I will forego a discussion on the topics of Jenkins masters and slaves. I suggest reading the previous entry which provided an overview of these concepts. When using the Jenkins swarm plugin as in the previous post, slave instances were provisioned by OpenShift in a predetermined manner similar to any other application deployment. The number of slave instances can be governed by project members or cluster administrators . These instances are configured with the parameters necessary to communicate with the Jenkins master, which in turned allowed them to register themselves to take on workload. The registration and discovery of the slaves does provide a substantial benefit to Jenkins administrators as they no longer needed to manually configure the slave instances within Jenkins. However, when working with the Kubernetes plugin, the responsibility to provision new slave instances belongs to the Jenkins master and is based on the current workload of the master. When the Jenkins master determines that there is a need for additional resources to perform jobs, it will utilize a preconfigured Docker image to perform the job. The plugin communicates with the Kubernetes (OpenShift) API to create a new container/pod. Using the parameters automatically specified by the plugin to start the container, the slave has all of the information that it needs to communicate back with the master to complete the registration and to perform the job. Once the job completes, the slave is then destroyed. A Continuous Integration server can act as a focal point for managing the builds and deployments of applications. As organizations adopt many of the principles of Continuous Integration and Continuous Delivery, the stability of a continuous integration server, such as Jenkins, becomes magnified. The majority of the components within Jenkins that most users are familiar with, such as the user interface and job configuration and execution, occurs on the Jenkins master. However, the execution of these jobs can be delegated to external agents, called slaves, to offload processing from the master. The utilization of slave agents is a natural progression many organizations move towards as they expand their Jenkins usage. Slaves are nothing more than instances that run a small Java program that communicates with the master to perform job execution. There are several strategies for configuring and managing slaves. The default implementation is to configure a slave on the master and have the master manage the lifecycle of the slave. While this process works and is the most straightforward, the time that it takes to configure and provision slaves is time consuming as there are a number of manual steps that needs to occur on both the master and the slave instances. Another strategy is for slaves to advertise and register themselves to the master. This is accomplished using the Jenkins Swarm plugin and is even more beneficial when working in a cloud environment, such as OpenShift, as slave instances can be dynamically allocated and scaled as necessary. Let’s walkthrough how jobs in Jenkins can be executed using a cluster of slave instances all running in OpenShift. First, let’s review the architecture of this implementation. Since OpenShift runs Docker containers, both the master and slave instances will each be running as Docker containers within OpenShift. There is no requirement that both the slave and master components needs to be running in OpenShift. But for simplicity, this is the architecture that will be described. Many organizations leveraging OpenShift as their Platform as a Service still utilize an existing Jenkins instance outside of OpenShift and I will cover how you can extend this demonstration to handle that use case. The project can be found on GitHub and contains the resources for adding the Jenkins master and slave components to an OpenShift environment. Both of these services enable the slaves to communicate with the master. Kubernetes services expose environment variables that can be consumed by pods.The slave docker image uses a wrapper script to start up the java process containing the slave agent where these environment variables are referenced along with additional parameters such as the user name and password that will be used to connect to the master as well as the number of build executors. We will see how we can configure and manage these properties later on. Also included in the repository are two OpenShift templates that allow for the cluster to be instantiated with ease. The difference between the two templates is that one provides support for persistent storage. More information on persistent storage can be found in the OpenShift documentation. The following diagram depicts architecture created by the template. Once the builds complete successfully, the new docker images will be pushed to the integrated registry and new containers will be launched. The Jenkins user interface can then be accessed at http://jenkins.<project>.<default-domain-suffix>. The default username and password is admin:password. Once authenticated, you are presented with the Jenkins main user interface containing a list of jobs. 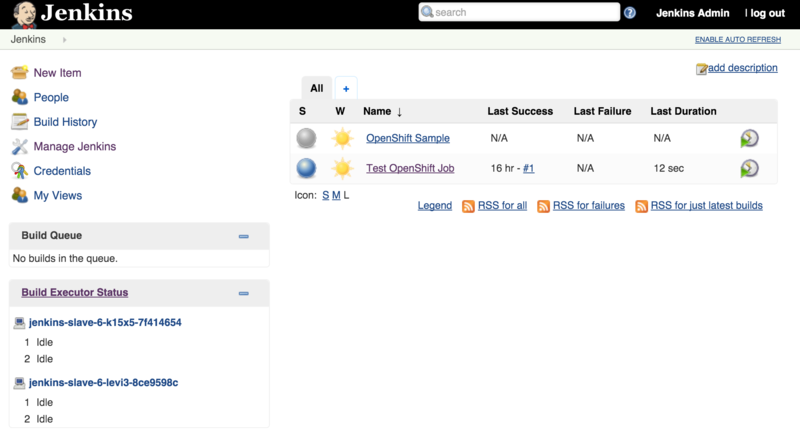 The default Jenkins image from Red Hat contains a sample job called “OpenShift Sample”. While we will not be utilizing this job, feel free to explore how it can be used in conjunction with OpenShift to create a continuous integration and continuous delivery process. On the left side of the page, you will see a list of build executors. This section is where Jenkins slaves will be listed. Since the template configured the build of a docker image and ultimately deployed a container, you should see one slave agent that has automatically connected to the Jenkins master using the Swarm plugin. View the result of the first job execution by clicking #1 under the build history. On the top right corner, the location of where the build occurred should be visible. With the job running successfully on the slave, lets discuss how OpenShift will be able to help handle increased load on the slaves in the future. One of the benefits of running within OpenShift is the ability to scale with ease by increasing the number of slave instances that are deployed into the cluster. To scale up the number of slaves, increase the number of replicas on the deploymentConfig. This will cause a redeployment of the Jenkins slaves as the Deployment Configuration was changed. Refresh the Jenkins user interface to show two executors are now available under each slave. The ability to manipulate either the number of slaves instances and the number of executors within each slave allows for greater control managing job resources within a Jenkins environment. The combination of the Jenkins Swarm plugin running in an OpenShift environment provides the stability and reliability for a robust continuous integration environment. Several months ago, an article was published by OpenShift lead engineer Clayton Coleman on how the OpenShift API can be expressed using Swagger. For those who have never heard of Swagger previously, it is a framework for describing and producing a visualization of a RESTful API. The post gave users an excellent introduction to the resources exposed by OpenShift. Fast forward a few months, and now that OpenShift has been officially released, it is a fine time to revisit Clayton’s post and provide updates to allow users to interact with the GA version of the the product and cover any necessary configurations that need to be made beforehand. The cURL command can be used to validate the endpoints against an existing OpenShift environment which will produce a Swagger formatted json result. The power of the Swagger framework is realized by the ability to take this API representation and present it in a consumable form for the user to interact with such as retrieving results and invoking requests. These interactions are facilitated using the Swagger UI. The endpoint is unsecured by default so listing the functions can be completed without entering a token. First, enter the URL of your OpenShift master. For example, this could be https://master.openshift.example.com:8443. Next, select the API to invoke (either the Kubernetes or OpenShift API) from the dropdown. Then enter the api version in the next textbox (A dropdown of values is available to aid with input selection). Then hit the Explore button. It may take a moment for the page to render, but once finished, the list of functions for the selected API should be presented. Consult the Swagger documentationfor the full range of capabilities provided by the the framework. Many of the API functions require an authenticated user for invocation. An authentication token can be obtained from a user registered in OpenShift to invoke additional functions in the swagger UI. The token can be obtained using the OpenShift CLI from a developer machine. The token value should be provided. Enter this value in the token textbox in the Swagger UI to allow for the execution of additional resources the user is authorized to invoke. The source code for the project is located at https://github.com/sabre1041/openshift-api-swagger and contributions are always welcome. One of the features introduced in JBoss Fuse 6.2 is the ability to utilize Role Based Access Control (RBAC) to govern the capabilities authenticated users have when interacting with the container. RBAC is important because it allows for a delineation of the roles and responsibilities of users managing the Fuse container to exist. For example, a team may have a set of individuals who manage the configuration of the container including all deployed applications in a system administrator role while another team may have a set of individuals whom have the responsibility for monitoring the state of deployed application. RBAC provides the ability to restrict access to the monitoring team to only view the state of the container in a read only manner while providing unrestricted access to the administrator team. Fuse and the underlying Karaf container provide a flexible framework for configuring and managing Role Based Access Control configurations. RBAC was initially introduced in Karaf 3.0.0 and subsequently ported back version 2.4.0 for which Fuse is based off of. The enforcement of Role Based Access Control in Fuse is accomplished with the help of two mechanisms: JMX Guard and OSGi guard. JMX guard is a mechanism that is configured at the JVM level to intercept all invocations made against the JMX interface, similar to a Servlet Filter. As an invocation is made, JMX guard verifies the requestor has the appropriate permissions and based on the assentation, they are either granted access to the resource or denied. OSGi guard on the other hand governs the ability to invoke methods on an OSGi service in the form of a proxy between the client and the service. Both JMX and OSGi guard use Access Control List’s (ACL’s) for declaring the methods and services that are to be secured and the roles that have access. All of the ACL files are located within the etc/auth folder of Fuse. There are two types of ACL’s, JMX and command based. Default configurations have been provided, but you are free to modify and customize as necessary. This type of read only protection is also extended to other core components of the Fuse Management Console such as ActiveMQ and Camel JMX pages and can be further customized. With the inclusion of Role Based Access Control support, it is now even easier to manage and govern access to the JBoss Fuse platform. A full description of the features and capabilities of Role Based Access control can be found in the JBoss Fuse product documentation. Software today is being developed and released at a breakneck pace. No longer are organizations relying on a yearly, quarterly or monthly release cycle, but can now churn out multiple releases daily or even hourly. Two technologies that help facilitate this type of delivery model are Spring Boot and Docker. Spring Boot provides a lightweight microcontainer architecture for rapid development and deployment. It takes a Configuration over Convention approach to application development by leveraging resources on the java classpath to configure the application, which are then packaged into an executable jar. Since Spring Boot contains an embedded web container, an external container such as Tomcat is not required (Spring boot can be packaged into a traditional archive for deployment if desired). Docker on the other hand is one of the fastest growing technologies today and has changed the way many organizations package and deploy applications. It allows for an entire application environment to be assembled into images and deployed within containers. Docker Images are typically small in size and the creation of container is extremely fast compared to traditional virtualization technologies enabling rapid deployment and portability across machines. With the recent release of version 2.15.0, the Apache Camel project now provides direct integration and support for both Spring Boot and Docker. The spring-boot component allows for the Camel context to be autoconfigured by components and configurations from a spring boot application. This includes the auto detection of Camel routes and injection of spring boot properties for use within Camel. The Camel Docker component communicates with the Docker daemon through the Docker rest API and exposes operations such as manipulating Docker images and containers within Camel to be notified when events within Docker occur. To illustrate the integration with these technologies along with several other components released in recent versions of Camel, a sample application has been developed. To facilitate user interaction with the application, a web page will be configured to allow users to view events from the Docker daemon in real time and also provide links to retrieve statistics from Docker. Instead of invoking the Docker rest API directly, Camel will be positioned to proxy the requests and expose a restful interface. Camel makes it easy to create restful endpoints by providing a DSL for creation and configuration. Since it is desired for events from Docker to be viewable on the web page, careful considerations should be made on the most efficient method to architect the solution. A polling mechanism to a Camel endpoint could be implemented by the web page, but this would be an expensive operation with regards to network traffic, as the majority of the requests would result in no consumable responses. On the other hand, if websockets were utilized, the amount of network traffic between the client and the server could be drastically reduced and be more efficient as the client would receive a response from the server immediately as an event occurs instead of waiting for the next polling interval. 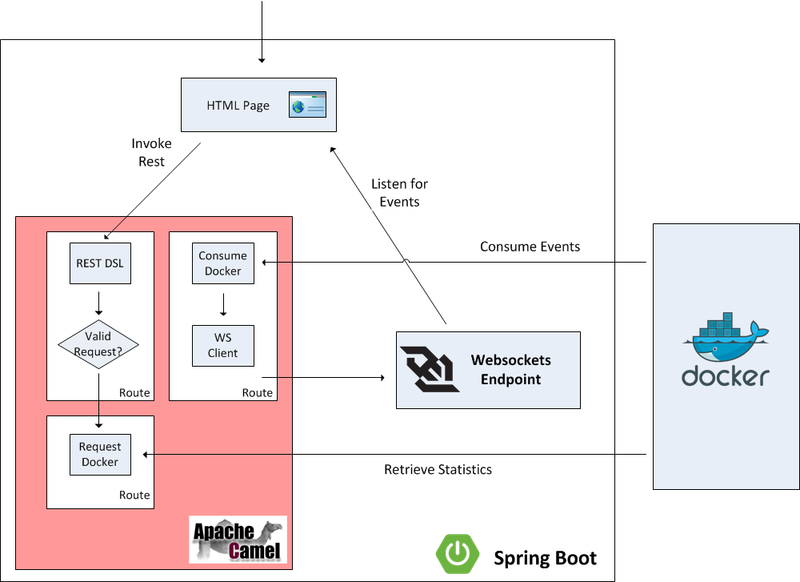 Spring Boot provides the capabilities to define and publish websockets endpoints that Camel can publish events to. Lets step through each aspect of the application to get a better understanding of the components involved and how they are able to integrate with each other.